Since centuries, a whole set of shared economies and ecologies have tightly bound human society and honeybees. Whereas the fascination for bees has triggered a great amount of literary contributions becoming a powerful conceptual tool to imagine the multitude and the society, in recent years the beehive metaphor has been widely reconsidered in the realm of political economy. Emphasizing the shift from a manufacturing-based to a service-based labor, economists such as Yann Moulier-Boutang, refers to a post-industrial society as a pollen society. What was considered as an externality of secondary importance during the industrial era, like bees’ pollination, cognitive and affective labor became the very core of the new economy. Along the economic metaphor, recent ecological crises prompted a renewed interest in the fragile relationship between the human and the bees. Since 2006, repeated and exacerbated collapses of honeybee colonies reinforced the prospects of a gloomy future. The media and activists voiced a general outcry against pesticides, forecasting as inevitable for the generations to come the labor-intensive process of a hand-pollinated agriculture. 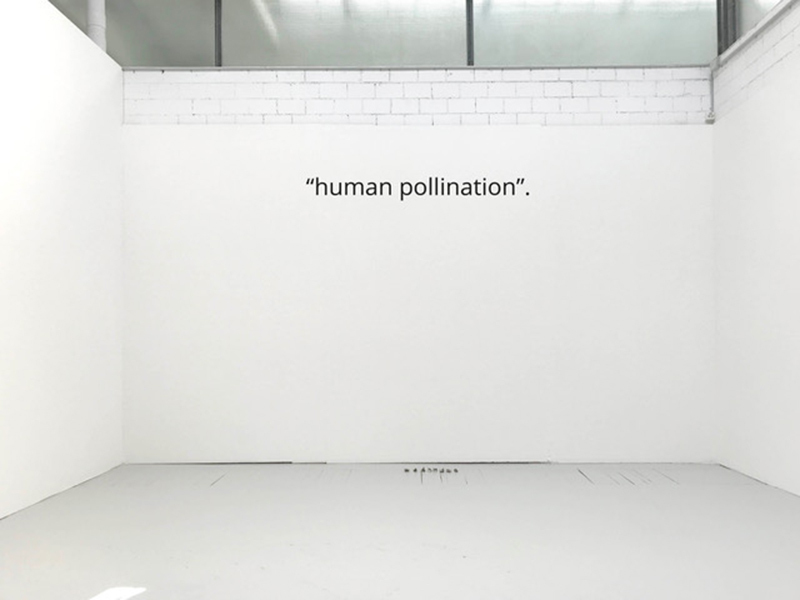 In this perspective, the often-quoted term “human pollination” voices and intertwines afresh animal and human labor. It embodies a constant oscillation between ecological concerns and political-economical speculations, forcing to consider common notions such as work and production beyond anthropocentric logics and interests. Pascal Schwaighofer’s artistic practice focuses on metaphors, legends and analogies of apparently unrelated narratives, politics, and aesthetics. His recent works dwell on the ontology of the Animal and its Western iconography, and he is presently working on a video essay around gene manipulation and film editing. He graduated from the Accademia di Belle Arti in Milan in 2003 and is currently a Ph.D. student at the Cornell University, Ithaca, USA, writing a dissertation on the politico-philosophical implications of the swarm, network and multitude, iconically embedded in the “honeybee metaphor”. Recent lecture-performances include La classe sterile, with Christian Marazzi, at Museo Vincenzo Vela. In 2016 was released Tulipmania, a publication based on a dialogue between Jan Verwoert and himself as an extension of a multi-part work called Economimesis.